Go to DogBreedStore, online at DogBreedStore.com, for accessories and home decor to remind you of your best friend. DogBreedStore offers a variety of fun items, including umbrellas, socks, key chains, picture frames, playing cards, stickers, water bottles, calendars, stationary, lunch totes, and many more gifts featuring the dog breed of your choice. Whether you love bulldogs, beagles, collies, black labs, golden retrievers, jack russell terriers, chow chows, boxers, German shepherds, cocker spaniels, pomeranians, poodles, pugs, or any other wonderful breed, DogBreedStore.com is the first stop shop. But before you shop, get all the latest DogBreedStore.com discounts Dog Breed Store promotions, and Dog Breed Store coupon codes found here at RetailSteal.com. DogBreedStore delivers within the United States, APO/FPO addresses, and U.S. Territories. Shipping within the U.S. is calculated based on shipping method and type of product. See site for more information. Save 20% at DogBreedStore. Click here to shop and use coupon code on purchases over $30. Save 10% on all orders from DogBreedStore.com. Use coupon code to enjoy. Enjoy free shipping on any order from DogBreedStore when you use this coupon code online. Click to save. Save 15% on your Christmas Ornaments purchase from DogBreedStore. Click here and use this coupon code to save. Enjoy free shipping from DogBreedStore. Click here to shop and enjoy offer on purchases $25+. Save up to 60% or more on accessories and items on sale at DogBreedStore.com. Click here to shop the bargains. 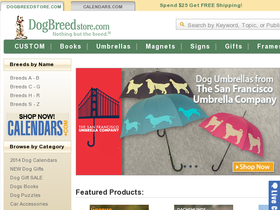 Enjoy savings up to 50% on 2013 calendars from DogBreedStore. Shop today and save. Pay only $5 for standard shipping in the United States at DogBreedStore. Click link to get started. Save 20% on your purchase of $30 or more from DogBreedStore when you use this coupon code at checkout! Shop at calendars.com and get dog calendars starting at just $7.99. Shop at calendars.com and get all dog toys for only $9.99. Click here to shop.